Who would be a doctor in China? There's something about Chinese New Year that makes people a bit more bonkers than the rest of the year. Maybe it's the social pressure, the expectation - who knows. 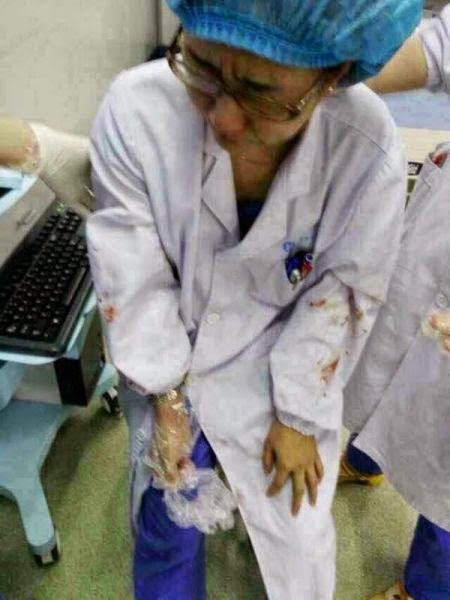 But this week has seen an unprecedented number of attacks on medical staff in China. First there was the "hostage siege" at a Henan hospital at which doctors were bailed up by patients and forced to drink urine. The incident occurred after doctors failed to save the life of a drunk man who had killed himself by drinking insecticide. The man's relatives became angry when he died and accused emergency department staff of not doing enough to save him. The staff said they did all they could but he was already beyond help when brought in. The family became enraged and summoned more people to blockade the hospital entrance. They then barricaded the doctors in their office and tried to force them to drink urine. The situation was only defused when riot police arrived. Sometimes violence is more random. At a Jiangsu hospital a cardiologist was attacked suddenly by the son of an 82-year old woman who died. The man became angry when requesting a death certificate, grabbed the doctor's stethoscope and used it to hit the doctor on the head, causing a major wound that bled. Police are investigating. And in another similar incident in Hubei, a young female doctor had her skull fractured (see picture) when she was attacked by relatives of a women who died of a heart attack. Witnesses say the female doctor had been trying to resuscitate the women but was unsuccessful. She had not even taken her gloves off when she was attacked by a male relative of the dead women who hit her so hard it fractured her skull around the eye. And finally in Hangzhou a female psychiatrist was stabbed by a 16 year old patient at the city's Jingdu hospital. The doctor is in a stable condition, and there is no stated reason for the attack. And even if the patients don't physically attack you, thy may take to the courts instead. This week there was a report of a female obstetrician who is facing a three year jail sentence for manslaughter after being prosecuted over the death of a baby during childbirth. However, colleagues of the doctor say she is being made a scapegoat and there should be no criminal case made against doctors in medical situations such as this. A survey of 910 doctors in from teaching hospitals found that two thirds only read medical journals in Chinese. Only 44% were aware of major English-language journals in their speciality and 17% said they had never read a single English paper or textbook in English. In an attempt to cut down on pharmaceutical corruption and bribery, China's hospitals have been told they must buy their drugs only from approved pharma companies and wholesalers. The move is intended to cut out the system of commissions and kickbacks that currently exists, and which encourages hospitals to buy and use more expensive drugs. Health authorities in Hangzhou have achieved dramatic reductions in hepatitis B thanks to a long term vaccination campaign. In a comparison with 1990 a recent survey found that the hepatitis B incidence and mortality of Hangzhou had declined dramatically since the introduction of universal childhood vaccination against the infection. Rates of drug resistant tuberculosis are "alarmingly high" according to researchers from Beijing. A study by the China CDC of Mycobacterium tuberculosis strains from children and teens between 2005 and 2012 found that levels of drug resistance and multi-drug resistance (MDR) rates were 55% and 22% respectively. In children with multi-drug resistance, new cases accounted for 41.